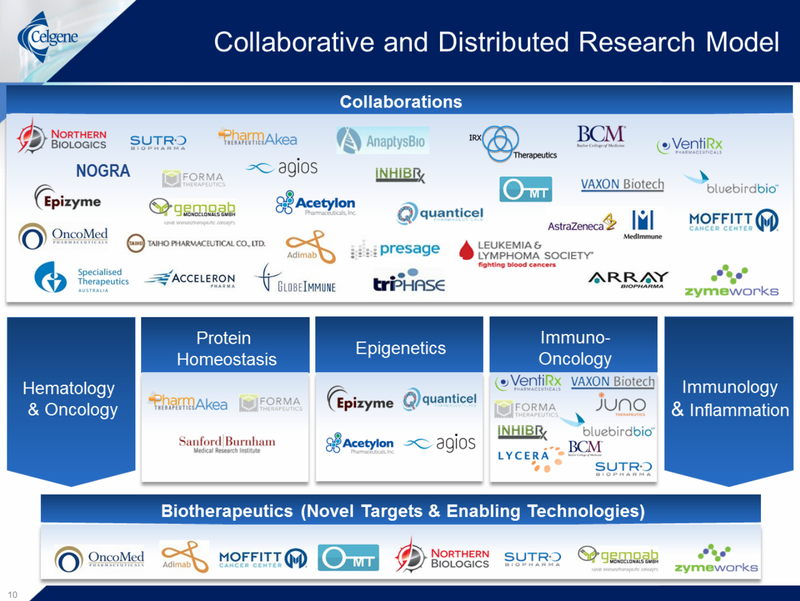 The Celgene and Juno Therapeutics executive teams held a joint webcast on June 30th, 2015 to discuss their newly announced large-scale collaboration deal in T-cell technologies (press release). The deal is noteworthy for its broad scope, 10 year duration, and unique terms with upfront $1B in cash and stock purchase with defined future opt-ins for candidate development and equity purchases. Specific dollar values are not disclosed for future options beyond the percentage of Juno stock that Celgene could purchase (up to 30% in two tranches) and a range for the royalty payouts for programs that Celgene opts into (high single digits to mid-teens, depending on when in clinical development rights are exercised. This deal is being framed as building a true on-going collaboration with Juno also gaining opt-in rights to co-develop some of Celgene’s programs in T-cell related therapeutic areas including small molecules in biologics. Celgene, which has been known to make big, early investments in novel platforms (see Acceleron, Avila, Sutro, Quanticel) has seen mixed reaction to this particular transaction. Certainly, Juno will benefit from Celgene’s resources and experience to expand and expedite its clinical programs. However, a number of scientific and technical challenges remain to be tackled, some of which may prove to be intractable. While the size and boldness of this deal reflect the currently white-hot biotech dealspace and Celgene’s appetite for risk, this is not the company’s first foray into the cellular approaches to immuno-oncology. In 2013, the company inked an exclusive, multi-program deal with bluebird bio for its CAR-T cell assets, though this deal was recently refocused to only a single development program. Only time will tell whether a larger commitment to the CAR-T field is prescient or overly optimistic.